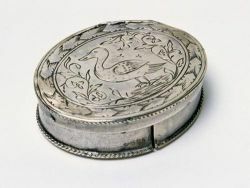 Silversmithing is usually considered one of the luxury trades, involving the manufacture of silver utensils of a wide variety. These include flatware (forks and spoons); knife handles (hollowware); bowls; tea, coffee, and chocolate pots; serving trays; tankards and cups; and many other accessories, including jewelry. Silversmithing in North Carolina developed more rapidly than in other southern colonies because importation to the colony was limited by the poor coastal harbors. The demand, although somewhat limited in the eighteenth century, increased steadily as the population of the colony grew. The large oceangoing ships from England could not easily trade with citizens of the colony, but smaller coastal schooners from New England and the middle colonies as well as the West Indies established a lucrative silver trade with the early settlers to eastern North Carolina. Silversmiths also were among the numerous settlers who followed the Great Wagon Road from southeastern Pennsylvania during the last half of the eighteenth century. As the century came to an end, silversmiths were working throughout the state in the more populated areas. John Bivins and Forsyth Alexander, The Regional Arts of the Early South (1994). George Barton Cutten, Silversmiths of North Carolina, 1696-1860 (1984). North Carolina Museum of Art, Two Hundred Years of Visual Arts in North Carolina (1976). "This engraved patchbox, ca. 1720, was used to hold small pieces of fabric that women used as fashion accessories. The maker is unknown." Image available from the NC Museum of History. Available from http://ncmuseumofhistory.org/silver/index.html#patchbox (accessed September 28, 2012). "Spoon by John Vogler." Image available from the NC Museum of History. Available from http://ncmuseumofhistory.org/silver/index.html#patchbox (accessed September 28, 2012). 1 January 2006 | Lewis, Michael H.
I would like to know if I could get a few business names and contact information for silversmith's that make jewelry. There is a ring I have a picture of and would like it to be made in silver if possible. Thank you for posting your question. Elizabeth Hayden in Reference Services at the Government & Heritage Library will be emailing you to follow up on your inquiry.